[October 21, 2013] By discussing core values, it is again easy to select an organization that clearly articulates its values. The U.S. Army has seven values which follow the acronym LDRSHIP. They are: Loyalty, Duty, Respect, Selfless Service, Integrity, and Personal Courage. There is the expectation that every Soldier, regardless of rank, memorizes and lives by those values. The U.S. Marine Corps and U.S. Navy values are: Honor, Courage, Commitment. The U.S. Air Force values are: Integrity First, Service before Self, Excellence in all We Do. And, the U.S. Coast Guard values are: Honor, Respect, Devotion to Duty. What stands out quickly is the similarity of the values listed. Interestingly, a review of many private corporate and public sector values are not that different from those identified here. You may have also noticed a similarity between these seven values and those I consider the top five values that most contribute to employee success. They are posted under Characteristic #9: The Right Values on September 19, 2013. The values listed here are a good set to live by even in your personal life. One thing that Soldiers talk about in living up to these values is that it is hard to do. 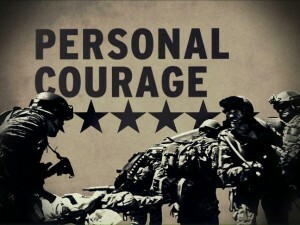 Most difficult to live by is personal courage (moral and physical courage). Standing up for what you believe in and what is right, is sometimes not popular, and can put you at risk. Being a part of the Army and living up to these values makes them stronger.